Shiny black vinyl longline corset in the hourglass silhouette. For those want to make a bold statement! Because of the warmth and lack of breathability of this fashion fabric, this corset is not recommended for waist training or daily wear. Please see the product description below for full details. The standard length corset is suitable for someone with an average torso length, and a relatively balanced figure who carries their weight equally on top and bottom. These corsets have a more hourglass silhouette, so it will nip in your waist and provide a more dramatic curve compared to the ‘slim silhouette’ corsets. This corset is also a good choice for those who have trained their waist and are able to fully close their previous Timeless Trends corset! This corset is Timeless Trends label, and is made to the same specifications as Timeless Trends. The standard length underbust corsets generally accommodate ribcage ~6.5 inches larger than the waist, and hips ~10 inches larger than the waist. For instance, a size 24″ corset would fit someone with a ribcage circumference of 30.5″ and high hip of 34″. However, as a mass-produced garment there is a natural variation in these corsets so the proportions may not be exact in every corset. 11.5 inches long in the center front. 9.5 inches long at the princess seam. 9 inches long at the side seam. 12.5 inches long at the center back. It is generally advised that corsets are ordered approximately 4 inches (10cm) smaller than your natural waist – however if you would like to have your size verified before purchase, you may fill out the measurement form on this page. Please note that this sizing guide is only for the corsets sold on this website, and is not intended to replace a consultation (where external brands are discussed freely). This corset contains two core layers of cotton twill, and a fashion fabric of shiny black PVC. This is a synthetic “vegan leather”, not patent leather. All standard underbust corsets contain 20 spiral steel bones and 6 flat steel bones, plus a front fastening busk and back grommets/ laces. Hourglass silhouette corsets have a modesty placket by the busk, and 6 garter tabs instead of 4. A back modesty panel is not included, but we do have separate, boned modesty panels for separate purchase. You have a full 30 days from the purchase date to “try out” the corset and you can return or exchange it as long as the corset does not have any stains, scents, or obvious signs of wear. Just fill out the exchange form, ship it back and I’ll give you a full refund (minus shipping; USPS takes that). 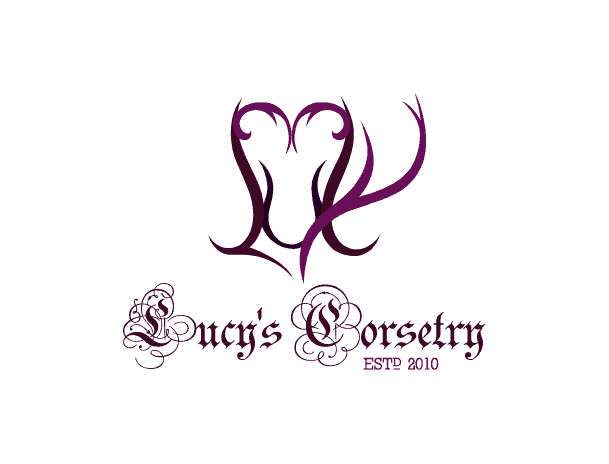 Lucy Corsetry does not charge any restocking fee! After the 30 days are over, the corset will not be accepted for refund, but it is still under warranty for life – some wear is normal, but if something prematurely breaks from normal use, your corset is still eligible for exchange. Please see our TOS and Policies for more information.